1970 issue of Harvard Educational Review a Fascinating Look Back on Adult Literacy in the U.S. 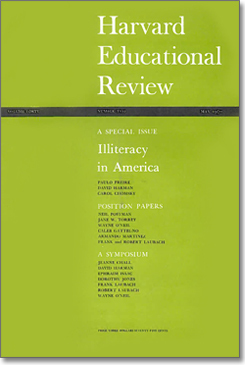 I stumbled on something this morning I thought readers of this blog may find of interest: a special issue of the Harvard Educational Review from the Summer of 1970 devoted to “Illiteracy in America.” Articles by Paulo Freire, Neil Postman (! ), Frank Laubach and others. Interesting to read what some of the big thinkers in the field were writing and thinking about in those days. Unfortunately not free unless you are a subscriber, but I know some of you are in library or university settings and might have access.